Mazen Muna says his first love was cars. 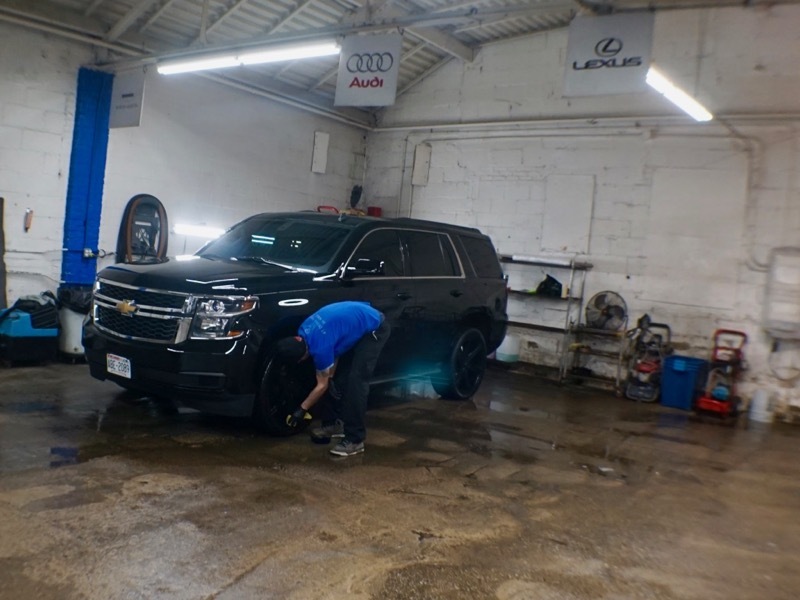 Published April 9, 2018 at 3:01 p.m.
Operating a high-end car wash and auto detailing shop in Downtown Milwaukee is a more delicate dance than you might expect. But if anyone can pull it off, it's Mazen Muna, the owner of Metro Car Wash, 1510. N. Van Buren St. The entrepreneur who brought Milwaukee the four locations of The Dogg Haus, Plum Lounge and a soon-to-open taco bar is now expanding Metro. He says he's looking to double its capacity. Starting this week, Muna will see the spot that he has leased since 2008 totally transform. In addition to replacing the concrete floor and making the business ADA compliant, he is knocking out the west wall of the garage, which means cars will be able to drive through. He will also offer electric car charging in the new area. The shop will remain open throughout the buildout, except while the concrete is being poured and cured. Muna says the improvements will allow him to greatly increase the volume of vehicles his staff services. On a busy week, he currently details up to 150 cars, motorcycles and even the occasional snowmobile. "This is a huge, huge deal," he says. "This construction will double the output and slash wait times in half." Muna says his business has evolved since we last profiled Metro in 2014. He says his staff has become trusted advisors to his customers – on all sorts of issues. Says Muna, "One of the things that we're starting to see more of is customers reaching out to management here and having them take a look over a car prior to the customer purchasing the car, basically giving them comfort, whether this is a car that has had issues." 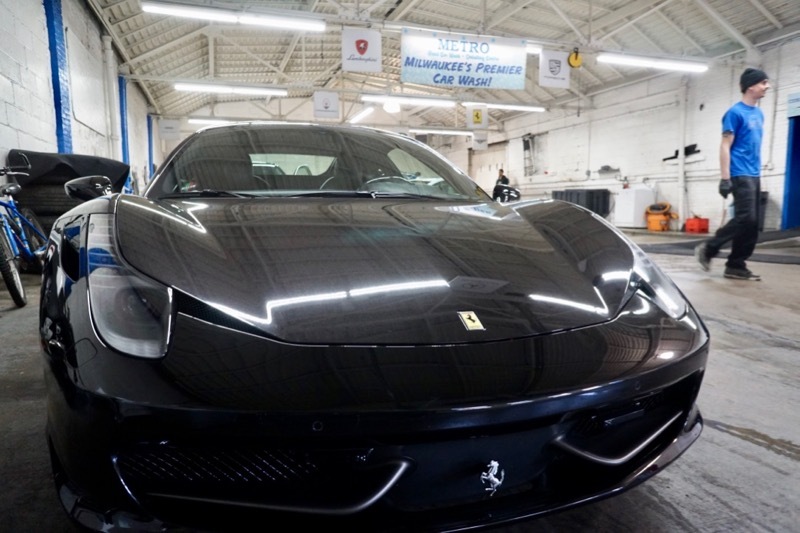 Additionally, Metro has a new satellite location in the 833 East Michigan Building, and works with other Downtown offices to get customers' cars cleaned while they're at work. Muna says he's also expanded Metro to provide services not commonly found Downtown, like wheel repair and paintless dent removal. Services range from $20 for an economy wash to $235 for a full detail including buffing, waxing and complete interior detailing. For a business owner who has to split his time between hot dogs, cocktails and car washes, Muna makes sure to give all his places plenty of love. "I like to spend time where I'm able to maximize my face-to-face time with customers," says Muna. "So where it's busy, I like to be there. The goal is to provide great service to every single customer across the board, whatever that may be." That means that Muna shares the same philosophy with sausage sales and car waxing. "We sell the customer what they need, with no oversell, with a focused approach and provide solutions that make sense."